I’m a huge fan of toasted marshmallows. When I was a kid my impatience to eat them meant a perfectly molten middle surrounded by an evenly golden, crisp exterior always escaped me. I usually ended up scorching my marshmallow on at least one side trying to speed up the process by getting it too close to the glowing coals. More often than not I ended up with a flaming, blackened mallow (which my brother would happily eat…to each their own) and I would have to start all over again. My love for marshmallows hasn’t faded (unfortunately neither has my impatience). After I made my last batch of coconut cookies with fleur de sel my husband and I were eating them smeared with nutella. Definitely a good thing. Our kids were each enjoying a marshmallow as a treat and an idea was born…a new take on s’mores. The idea was sitting and sitting until I was almost out of coconut cookies in the freezer. So I decided to give the “elevated” s’more a try with the last 4 cookies in the box. It was a blessing and a curse there were only 4 cookies left. Although it doesn’t taste quite the same as toasting over an open fire, in a pinch you can toast marshmallows over an electric or gas range, or under a broiler. I toasted mine stuck onto the end of a chopstick held under the broiler. I would have taken a photo but 1) it would have put me and/or my marshmallow in peril and 2) you could scrutinize the cleanliness of my oven. It’s not an unsightly mess by any means, but the likes of Martha Stewart would not be impressed. The coconut cookies are simple to make with only five ingredients so the next time you have a BBQ or just a hankerin’ for something more than your run-of-the-mill s’more, surprise yourself and your guests with this new spin on an old favorite. 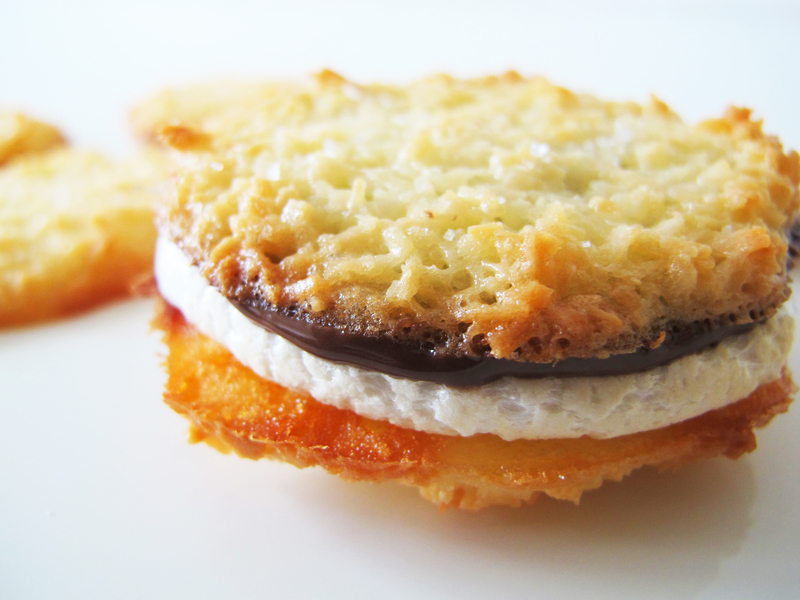 Take two coconut cookies, smear one, or both with nutella (depending on how fanatical you are about the stuff) toast a marshmallow, and squish the gooey golden marshmallow between the cookies. Looks delicious and picture is so stunning! Thanks! I have to admit I keep thinking about these. The only thing that stops me is the broiler/chopstick part because it takes a little effort. I’ve eaten gluten free graham crackers. I didn’t make any s’mores, but I enjoyed just eating the crackers. They are a little crisper than the wheat kind but that would be an advantage I think for making s’mores. Thanks. You should give the oringinal and the “elevated” s’more version a try for a little American classic action. One: I myself am a Semi-Swede. Mbnilsson…you have been tagged. I hope you have fun with it.